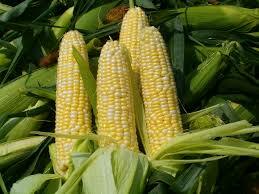 One of the oldest known cereal crops in the world, corn is a kind of grass with very large edible seed heads. Corn is versatile and can be added to soups, stews, pancakes, bread, soufflés, and casserole dishes. It can be sautéed, steamed, boiled, creamed, or grilled with great results. Searching ‘grilled corn’ at Saveur.com will give you several ideas on ways to use corn, from grilling to salads. To add corn to a vegetable pickle mix, leave on the cob and slice 1/2 inch thick. In addition to the traditional corn on the cob or succotash, sweet corn makes a grate addition to salsa. Grilled corn kernels (remove kernels with knife after corn has cooled), roasted peppers, red onion, garlic, black beans, cilantro and lime juice will make a delicious salsa that goes well with tacos and grilled pork or fish.